Kyle Busch is never satisfied unless he ends up in Victory Lane. But on Sunday (March 23) at Martinsville Speedway, third-place was about as good as it was going to get for Rowdy. “More raw speed” is what the No. 18 M&M’s Toyota Camry needed to contend for a win in the STP 500. The whopping eighth consecutive top five finish at the paperclip didn’t come easy though. The start of the weekend was un-JGR like, as they unloaded slower than normal. That was a common theme for Busch throughout the 500-lap event. Being so tough to pass, the bump-and-run was thought of more, but rarely executed well enough to complete the manuever. 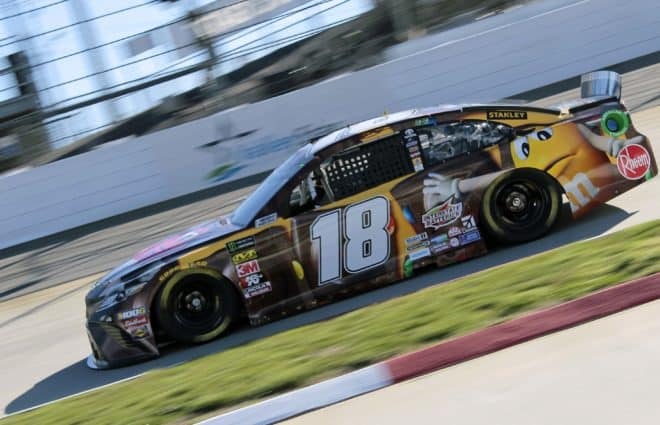 Busch credited his Joe Gibbs Racing team for the turnaround from the beginning of the weekend, and their diligence proved dividends. Busch will look to add to his impressive track record at Texas Motor Speedway next weekend. The O’Reilly Auto Parts 500 is scheduled to go green on Sunday, March 31 at 3:30 p.m. ET. Previous Pace Laps: NASCAR Experiences Martinsville Monotony? I know that this page is full of Toyota haters and Kyle haters. I am not one of them and I certainly think Kyle is showing a welcome change in personality. Kudo’s to Brad, Chase and Kyle for saving us from a completely boring Martinsville.